Above: Accrington Pals at Penkridge Bank Camp, Cannock Chase. Photograph courtesy of Paul Harrison. 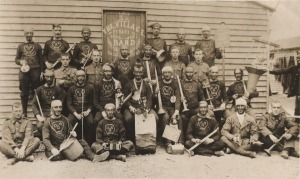 Click to enlarge Above: The 'Village Band' formed by men of X (District) Company. Photograph courtesy of John Garwood. At the end of July, the battalion left Penkridge to make a recruiting march through its home towns in East Lancashire before moving into huts at Ripon South Camp. 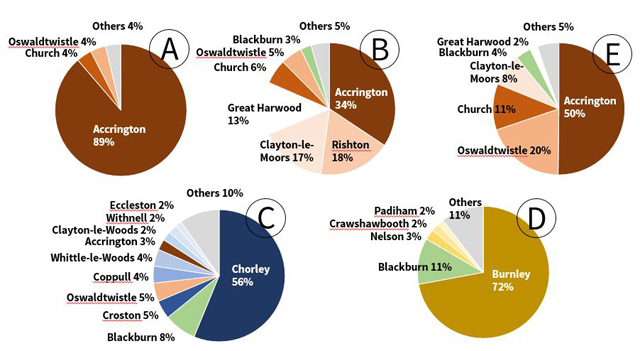 Above: Home towns of men recruited into A-E companies. Two weeks after their arrival at Ripon, the Pals were the first to make use of the new rifle range near the village of Bishop Monkton. 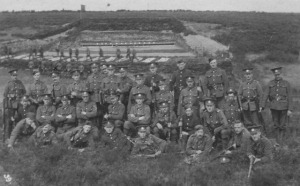 Above: X (District) Company group above the rifle range at Bishop Monkton near Ripon in August or September 1915. 15925 Pte. William Henry Parkinson is third from left in the back row. Photograph courtesy of Gilbert Parkinson. 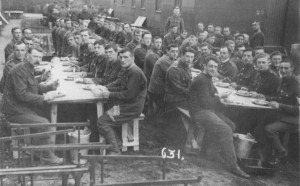 Click to enlarge Above: X (District) Company eating dinner at Ripon South Camp. 18048 Pte. Stanley Bewsher is seated second from the front, in the third row from the left. Photograph courtesy of John Garwood. After 4 days of welcome leave, the battalion moved on 24th September from Ripon to Hurdcott Camp3 near Salisbury where Major Edward Reiss took over as 2nd-in-command. As the Pals continued to take part in mock battles and route marches, the month of October was chiefly memorable for its terrible weather, though many were delighted to catch their first glimpse of aircraft in flight. Above: postcards courtesy of Kit Harvey and John Garwood. 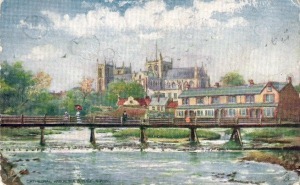 The postcard of Ripon Cathedral was sent by 15173 Cpl. 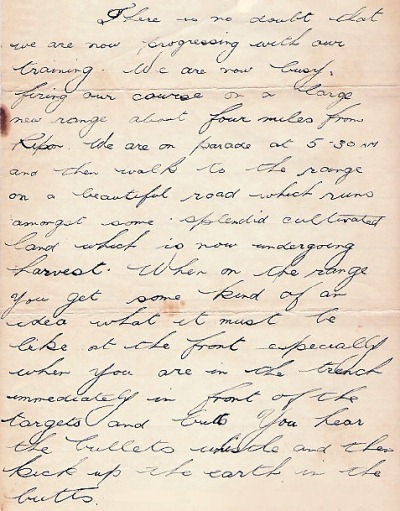 Richard Ormerod to his sister, Polly, on 23rd September 1915. 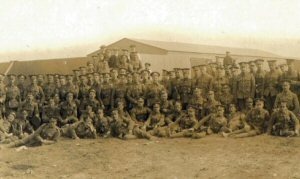 The Pals spent the last two weeks of November at Larkhill Camp, an interlude that allowed exchange visits with the Accrington and Burnley Howitzers encamped a short distance away at Bulford. 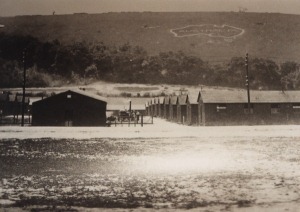 Left: Hurdcott Camp, and the map of Australia carved into the hillside in 1916. Photograph courtesy of Phil Guest. After a fortnight on readiness to move at a moment's notice, the battalion finally received orders to embark. In the evening of 18th December, the Accrington Pals marched out of camp, destined neither for France nor Mesopotamia but for Egypt. 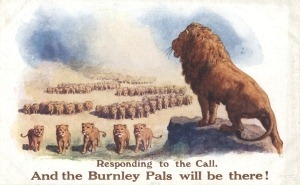 The Sheffield City Battalion, and the 1st and 2nd Barnsley Pals. Accrington Observer & Times, Saturday 3rd July 1915, page 10. More information on Hurdcott Camp can be found in the 'World Wars' section of the Fovant History Interest Group website. Accrington Gazette, Saturday 11th December, page 5. "The History of the East Lancashire Regiment in the Great War" edited by Major General Sir N. Nicholson. The chapters on the 11th Battalion were contributed by Francis Macalpine. Compiled from "The History of the East Lancashire Regiment in the Great War" edited by Major General Sir N. Nicholson, quoted sources, and with the kind help of John Garwood, Phil Guest, Kit Harvey, Peter Johnson and Gilbert Parkinson.